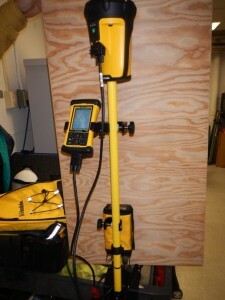 In addition to mapping out the subsurface geology, the single beam echosounder is often useful to generate detailed bathymetric models of the target area. Many of the places we core are not mapped in detail (ponds or lakes, or near shore regions removed from navigable waterways). Mapping lets us pinpoint depositional centers (basins and sub basins) but also gives us insight into the processes that have shaped the site and that act on the sediment. The Hydrolite Single Beam echosounder is an ultraportable bathymetric survey system consisting of a narrow beam transducer, small control unit, and a GPS providing sub-meter positional accuracy.